Searching for a fresh way to boost your protein intake? Then try our refreshing Mint Choc Chip Protein Booster! With a minty fresh taste, plenty of dairy free choc chips and packing 12g of plant based protein it’s a wholesome and filling snack. Cashews (23%), brown rice malt, rice protein, pea protein, chocolate chips (cocoa mass, sweetener (xylitol), cocoa butter, emulsifier (sunflower lecithin) (10%), sweetener (xylitol), chicory fibre, cacao butter (6%), cacao powder (4%), concentrated grape juice, rice starch. green tea extract, peppermint oil (0.12%) sea salt. 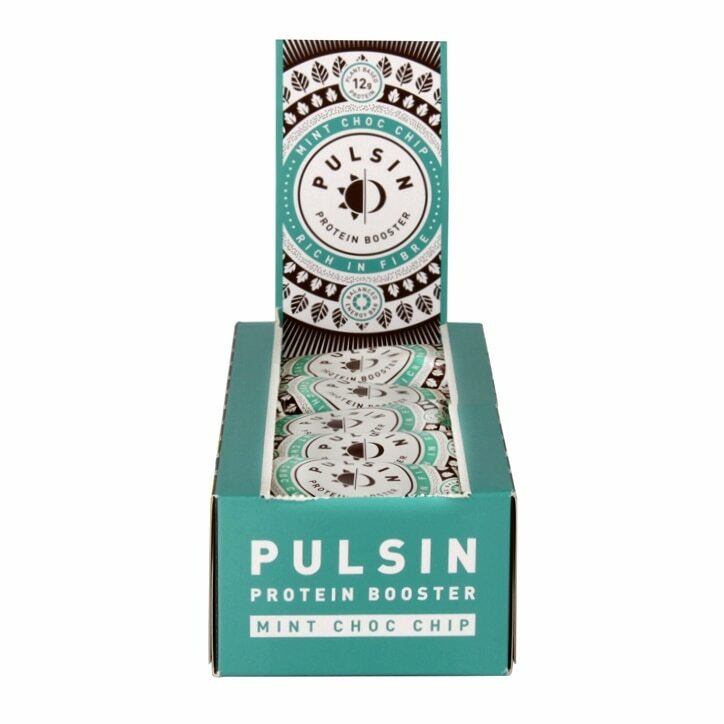 Pulsin Mint Choc Chip Protein Booster is rated 4.1 out of 5 by 7. Rated 5 out of 5 by Minty the mouse from Really tasty indeed Brought on a whim as I love the combination of mint and chocolate and these are lovely. Just the right size to keep you ticking over if the nibbles arrive. I would buy again without hesitation. Mostly web order? I couldn't find in one of my two local stores. Yet to look in the other. None the less, very yummy indeed. Rated 4 out of 5 by Liddylouise from Perfect for mint lovers! I bought this a couple of weeks ago in the half price sale. I got two boxes as it was much cheaper. I'm trying to gain weight and normally hate the taste of protein bars, plus it needed to be vegan. I really like taste although hubby thinks mint taste is too strong - more for me! Rated 5 out of 5 by LBerry907 from Just like ice cream It tastes just like an after eight crossed with delicious mint choc chip ice cream. It even has chocolate chips in the bar. Wonderful and will buy again. Rated 5 out of 5 by Tash775 from A chocolatey minty explosion Scoffed this straight after my workout and was pleasantly surprised by the minty freshness. Like eating an after eight but more satisfying and filling. 100% would recommend and will without a doubt be buying again.